This meditation music has a spoken word accompaniment that is thought provoking and calming. 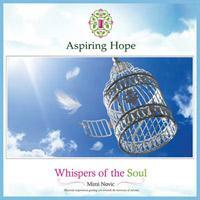 Mimi's positive words offer the listener a chance to reflect and travel with her into their deepest thoughts. Listening and thinking, one can reach a level of relaxed calmness that is both beneficial to the mind and also the body. This featured album ‘Whispers of the Soul’ is an audio and spoken word CD, composed specifically for the purpose of creating ambience for meditation and deep relaxation. Many also use this audio as a positive thought aid to clear the mind and focus on future goals.